Vulture at the Wheel The favoured steed of yummy mummies, Nissan's Qashqai, has become quite a hit. And it’s something that ticks all the boxes – high driving position, looks cool, eco credentials. All this is the kind of thing which would normally lead me to regard the car with caution; something which was all fluff and no substance. Particularly since it’s a front wheel drive car pretending to be a 4x4 and it has a stupid name. I feared another Renault Captur. What I found was a car I really rather liked. Over my week with the Qashqai I came to the conclusion that it gets away with the name – pronounced cash-kai – because it’s good enough to win you over. I even learned to spell it. There are lots of good sensible reasons to buy a Qashqai. It’s the top in its class with the Euro NCAP tests. You tend to think of Volvos and Renaults as being the winners here, so that gong is a bit of a surprise. One of the reasons it does well is the curtain airbags on both sides. The seat belts also have pre-tensioners. These things are becoming pretty standard. 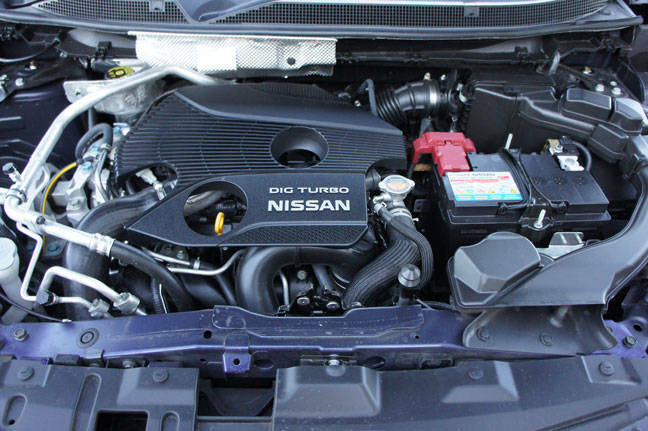 The turbocharged 1.6-litre DIG-T 163 petrol engine replaces the 2.0 in the Nissan range and does it well. It offers more power and less thirst: it will get the Qashqai from 0 to 62mph in 9.1 seconds, but has an urban cycle fuel rating of 37.2mpg, extra urban of 56.5mpg an combined of 47.1mpg. Nissan claim a maximum speed of 124mph.